The Flatyarbok (also Flateyabok, Flatyjabbok and other spellings), "the Book of Flat Island," is a part of the Poetic Edda. It is a history of the Norwegian kings in saga style and was composed 1387-1394. 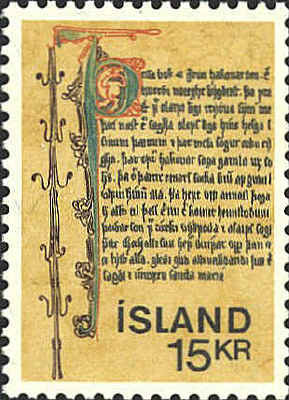 The first stamp shows an illuminated initial from the Preface to the Flatyarbok. 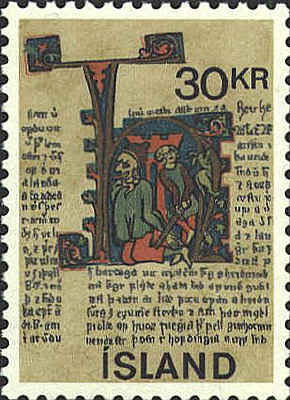 This stamp shows an illuminated "H" with a miniature of Harald Haarfager cutting the fetters of his foster father, the giant Dofri.